Former Pakistani Prime Minister Nawaz Sharif has been sent back to jail after a fresh corruption conviction. The anti-corruption court in Islamabad gave Sharif a seven-year term for investments beyond his declared assets. Sharif, who denies wrongdoing, was jailed in July in a different corruption case but bailed on appeal when the Islamabad High Court suspended his 10-year sentence in September. His party lost general elections in July while he was in jail. Former cricketer Imran Khan’s Pakistan Tehreek-i-Insaf (PTI) won most seats, after running on an anti-corruption platform. Security around the court in Islamabad was tight for Monday’s verdict. 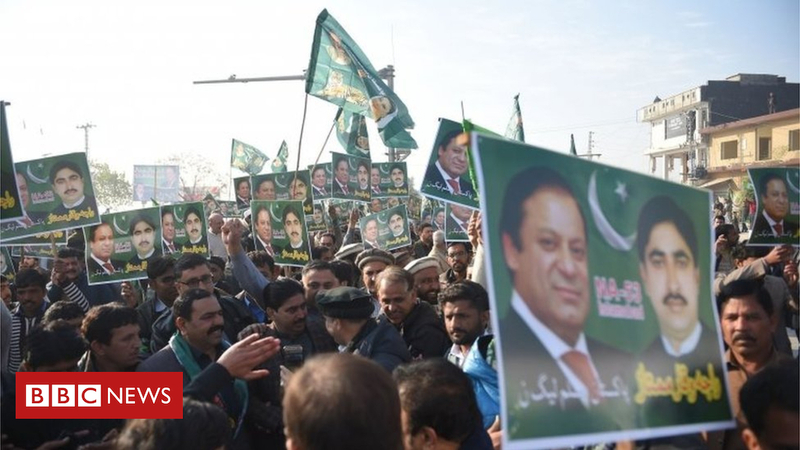 The former ruling party – the Pakistan Muslim League-Nawaz – had threatened to start a mass protest movement and disrupt parliamentary business if its leader were sent back to prison. Sharif has said the charges against him are politically motivated and is expected to appeal against his latest conviction. It acquitted him in a second case, Flagship Investment, in the UK for lack of evidence. His two sons, Hassan and Hussain, who are not in Pakistan, were declared absconders by the court. Sharif was arrested inside the court and is expected to be transferred to jail soon, Dawn news reported.